Click through for photos. 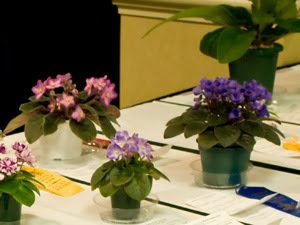 I don't have a good photo of Optimara Annabelle, but you can see it on The Gesneriad Society's website. Entry No. 345, Saintpaulia ''Optimara Annabelle'', exhibited by Sylvia Taub. Score: 98. First Place. Entry No. 485, Saintpaulia 'Halo's Aglitter', exhibited by Mary S. Schaeffer. Score: 89. Second Place.